Powercapes is a company from my own home state of Michigan. They are located on the southeast side of my state over by Lake Huron and Lake Eerie. Their manufacturing facility is located near metro Detroit if that helps you place the location a bit easier. They are a wonderful company that supports giving back to the community. PowerCapes is proud to offer their products as fundraiser items for schools, churches, hospitals, non-profits and all forms of children's causes including children with CHD. Superhero capes are what Powercapes is all about in case you could not already tell from the photo above. There are 11 capes colors available, 29 emblem colors and 8 designs to choose from for your custom cape. 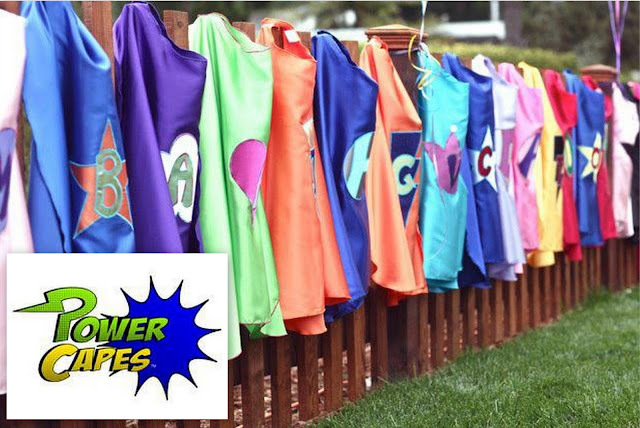 If you are not looking for a custom superhero costume they have over 3,000 premade capes ready to ship. They also offer a 100% satisfaction guarantee so no worries, if you are not satisfied you will be well taken care of. Sizes range from small, medium to large. Small children age 2 through adult can get their superhero groove on! My 6 year old loved running around in the cape and mask I chose. On the back of our cape we have a big yellow star. The size he is wearing is a small, it was intended for my 2 year old but he would only wear it for 30 seconds and then take it all off LOL. As you can see, the small size would be easy to share between siblings. The mask definitely helps to complete the look and it's not uncomfortable to wear. All capes come with a strip of velcro to secure around the neck. Having velcro there prevents any choking accidents and makes it simple to take on and off. This would make for an easy Halloween costume, just wear right over your warm clothes. My son says that his cape flies good when he runs because it is so silky and light. Mom loves the serged edges, premium satin fabric and the fact that the sizing allows you to get quite a few years of wear from one cape. Right now you can get a whole custom superhero set for just $49.95, that's 55% off! Use code NIBBLE10 to save an added 10% of any order, even sale prices. Powercapes' online ordering is really simple and they guide you through the whole process with prompts. Look for Powercapes in one of our Grand Prize packages starting 9/17!